It’s important to store data, documents and files safely, so investing in robust archive boxes is a must for protecting important confidential information. 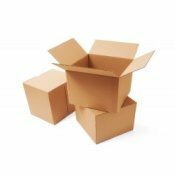 Here at Boxed-Up we have an array of archive boxes which are strong and sturdy and available to purchase in small and large volumes for next day delivery. Next parcel collection is in 3 days 12 hrs 33 mins Buy before then to get free UK Mainland delivery, for the next working day. Size: 15.5" x 10" x 14.5"
Size: 16" x 13" x 10"
Size: 18" x 13" x 13"
We pride ourselves on always offering the very best value for money - without compromising on quality. Our Single Wall Boxes start from as low as 6.5p per box (for 1000), and with bulk discounts available across our entire range, we trust you’ll find a product that suits your business as well as your budget. If you can’t find the box size you’re looking for, give our handy Box Finder a go, or contact our friendly colleagues who are always happy to assist.